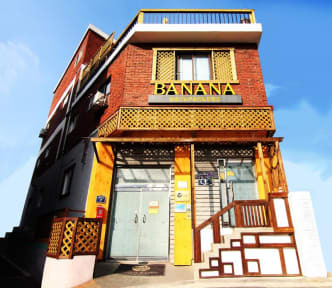 Banana backpackers is located near Seoul station just only 5 minutes distance by car. Also it’s very convenient place where it takes just 7 minutes from Sookmyung Women Univ. Station with walking path. Using metro Line No.4, You can get to Namdaemun Market, Myeongdong Shopping Area, Dongdaemun Market each 4, 6, 10 minutes taken. The place is just near Mt. Namsan (Seoul N Tower) which is the great landmark of Seoul, and Itaewon street, gyungridan-gil, National museum of Korea, War memorial of Korea is near Banana backpackers. You can feel and experience the diverse culture of Seoul like Music + performing arts, History, Shopping, Sightseeing. We're doing a month trip in korea and jumping from hostel to hostel. Banana backpacker sis in a great location and the staff are very friendly. Good places to eat at in the area and close to the underground. 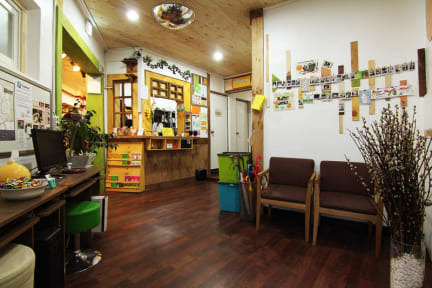 The hostel itself is about a 10 minute's walk from the Sukmyung University subway station stop and has a great view of Namsan's Seoul Tower in the background. It's not exactly close to downtown Seoul and it's not exactly far either if you don't mind walking. The price is decent as are the facilities. It's nothing fancy and it can get a bit cold in the winter, but it's worth staying a night or so for a a short-term stay in Seoul. Staff were very friendly, 5 minute walk to the nearest station which is convenient for Myeongdong, nice atmosphere, definitely recommend it. Very nice place. excellent location. Highly Recommended. I had a nice stay at Banana BP. The first night was really quiet—I had the dorm to myself! The common spaces are pretty small, and I mostly met people in my room. Everything is well kept and clean. It’s about 10min from a subway station and close to several bus stops on major routes. The neighborhood is quiet and resodential if that’s what you’re looking for. Overall a really nice stay. It was a bit far from the subway station but overall it had a very nice atmosphere and big clean rooms. When we arrived, front staff was very friendly. Showed us where we were on a map and where to find things and best ways to get around town. Fast forward to the room. A/C didn’t work, bed was insanely hard, mosquitos everywhere killed about 10 the first night, and the shower was pretty dirty and very small. This is a great spot for a night or 2 but not for an extended period of time. We’ve stayed in many hostels around the world and this is not one we would recommend. This was a nice hostel but nothing really made it stand out from the others we stayed in. It was a much farther walk from the ssubway station than we would have liked, fine with our day packs but it stucked when we had our full packs. The area had a few restaurants but most things were a 10-15 min walk away. We didn't see the host much, there were other people working on and off throughout the days we stayed. The room was nice and clean and mostly pretty quiet.